General Description:It is an aquatic, bottom-rooted perennial with long branched stolons extending up to 3 feet or more and creeping rhizomes. Leaves are on stalks and are floating on the water’s surface. 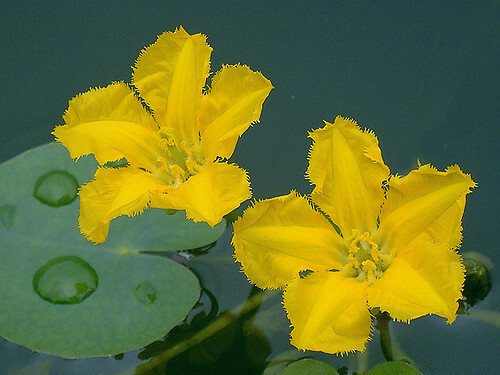 Flowers are on stalks and grow just above the water’s surface. Leaf Description: Leaves are floating, heart shaped, frequently purplish underneath, slightly wavy, and have shallowly scalloped margins. They are alternately arranged on stolons and oppositely arranged on flower stems. Fruit/Seed Description: The fruit is a capsule about 1 inch long and contains numerous flat, oval seeds.